国際リンパ浮腫フレームワーク・ジャパン研究協議会では、本学会の目的に基づき、新しい研究成果を発表する「研究論文」の掲載、および関連技術や施設の紹介、ならびに学会からの情報等の掲載のため、「リンパ浮腫管理の研究と実践」を定期的に発行しております。本誌はフリーアクセスオンラインジャーナルです。LYMPHOEDEMA RESEARCH AND PRACTICE is the official publication of the Internatinal Lymphoedema Framework Japan (ILFJ).The purpose of the journal is to provide towards a better management of lymphedema and chronic oedema and related disorders. 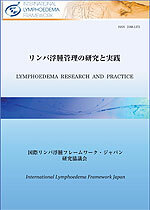 The ILFJ is an authoritative resource devoted to evidence-based nursing practices and management of patients with issues related to lymphedema and chronic oedema. Original peer-reviewed articles examine these topics in hospital, home, and long-term care settings.